I had a chance to pick up a bottle of this during one of my trips to Bangor (the Hogan Rd. Deli has to be the most incredible selection of beer ever to grace a gas station). I popped this open to have with dinner tonight. De Dolle Brouwers means “The Mad Brewers”, and Oerbier means “original” beer. 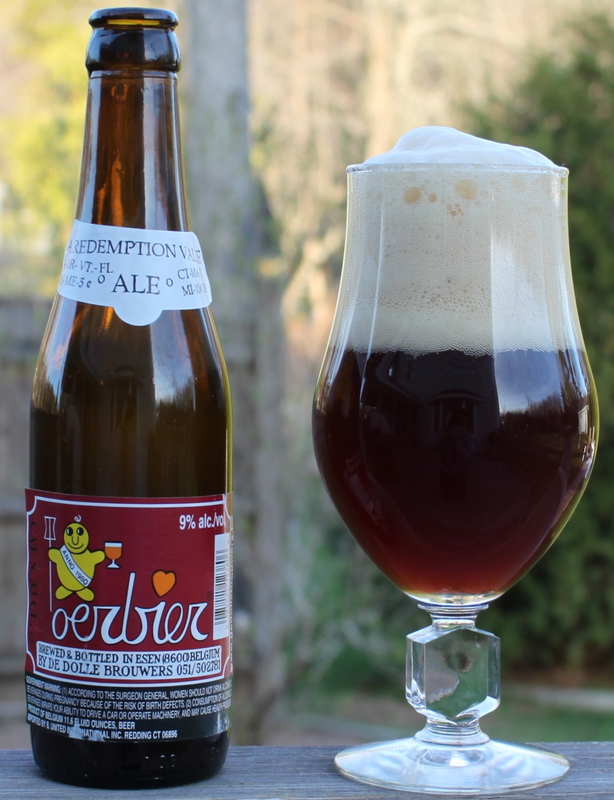 This beer was initially brewed with a culture from Rodenbach, but that is no longer the case. The motto of the brewery is “Naf en Straf” which means “Wet and Strong”. This beer does not disappoint with a 9% ABV. When you pour this beer out, you get this big thick head that sits around for a while. It is highly carbonated, and took a few minutes to drop. It is a murky reddish brown color. The initial smell is very estery, lots of dark fruits (raisins, cherry, grape) with some malty sweetness to it. There is not really much hops that I can appreciate on the nose, but there is a hint of some sourness. The taste starts with the fruity flavors, followed by a pronounced hop bitterness, but you get this more in the middle then at the end where you usually get the bitterness. Instead, at the end it has a hint of acidity to it. The mouthfeel is quick thick and coats the mouth, but not overly so. It is sweet, but the hops and the acidity balance it out nicely. It has a certain port like quality to it that I enjoyed. What can I say, the glass went empty way too fast. I thoroughly enjoyed this beer. It has a lot going on, lots of fruit, good bitterness, some sweet portlike qualities, and a touch of sour. This is an impressive beer, and I would certainly seek it out again.